Dahl bat gave us the power to cross the Himalayas on foot, ascending thousands of metres across landscapes from another world. 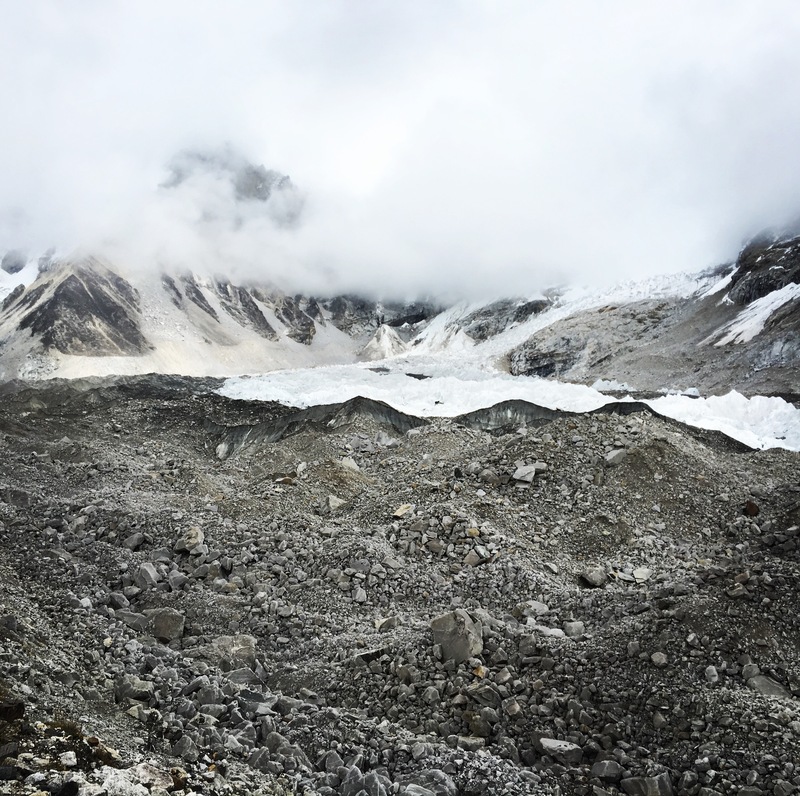 In the last few days of ascent we have crossed melting glaciers, crumbling boulder fields, mud-slicked trails, barren gravel strewn valleys and scrambled up rock studded slopes. 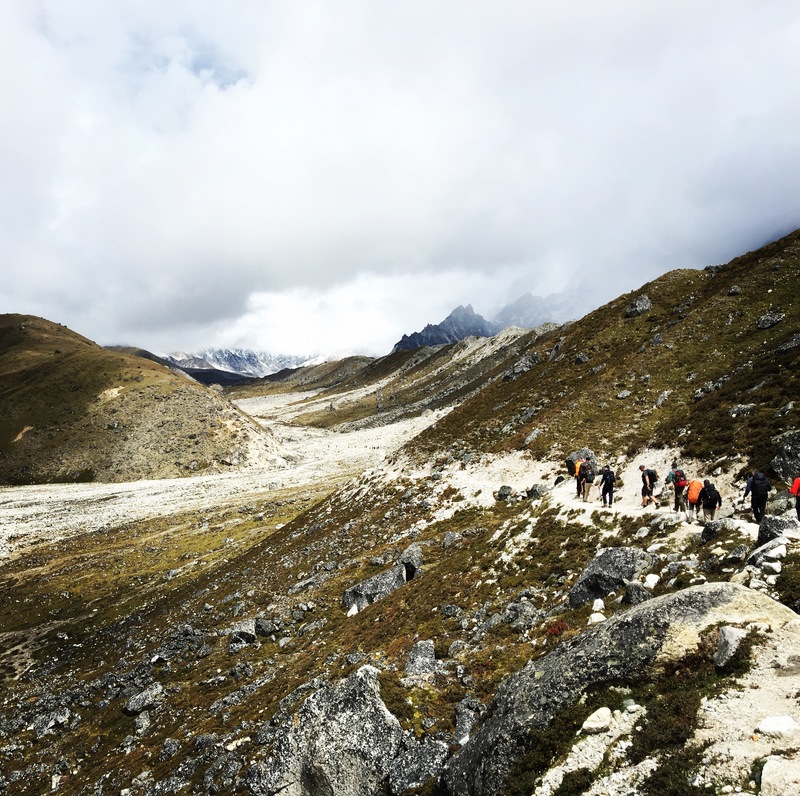 After a pit stop at Gorak shep, we continued our journey upwards, to Everest Base Camp. The remoteness of this location must be experienced to be understood. Nestled in a glacial valley, surrounded by soaring peaks, ice and rock. There is nothing there and it is at least two hours hike to Gorak Shep, home to a few lodges and tents. Reaching Everest Base Camp was a truly inspiring experience and to do it in the company of such interesting, determined and truly great people has been a real privilege. Obviously we celebrated with a bit of whisky! 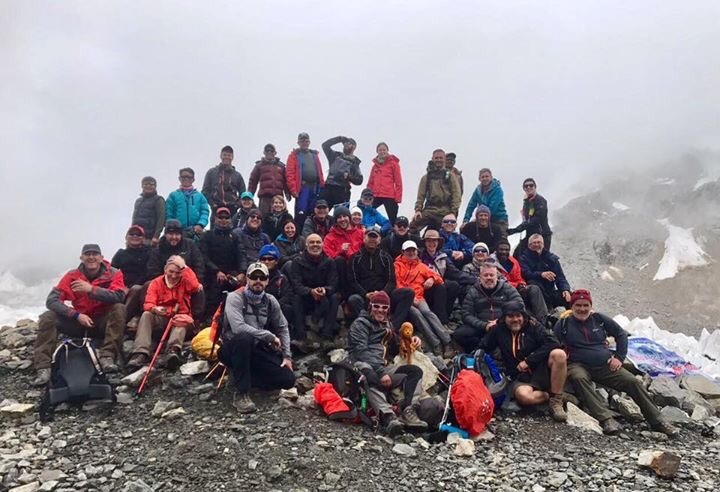 This achievement would not have been possible without team leadership and expert guidance from explorer Mark Wood, lead guide Devendra Rai and our incredible support team including Yogi, Mauri and Hiro. Our journey does not stop here. 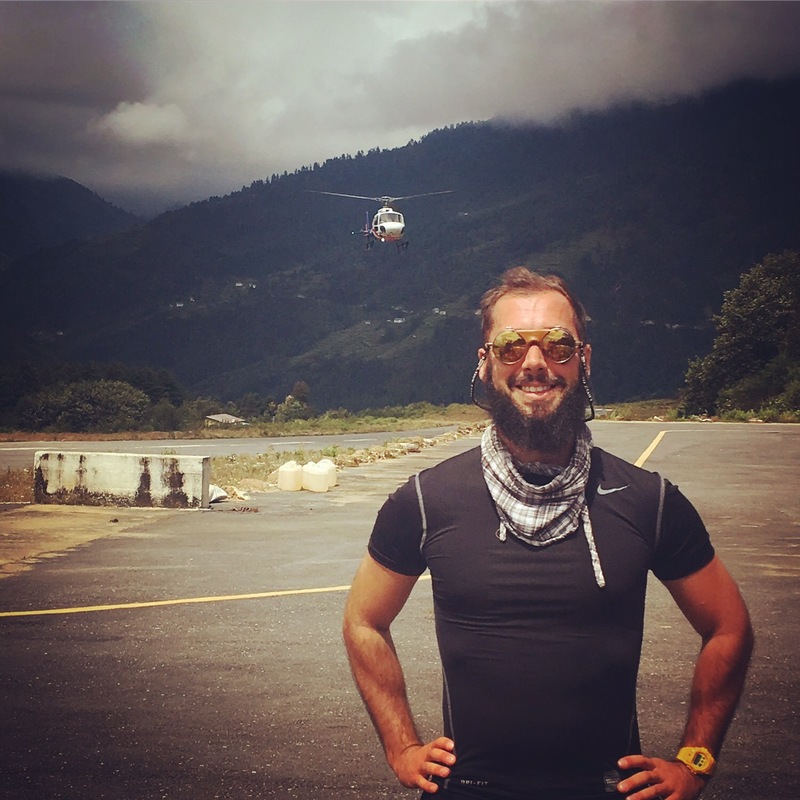 After a refuel back at Leboche we will head to the Gokyo pass and from there attempt the summit of Gokyo Ri, at over 5,000m these places are higher than anywhere in Europe and represent an exciting and significant challenge. From the summit of Gokyo Ri, if conditions allow it is possible to view a panorama of the highest peaks in the Himalayas – from the top of the world. Our expedition team is about to be pushed to its limit for the next few days, trekking for up to 8 hours or more per day at very high altitude – at times with no options for hot food, water or resupply. Find out how we get on here soon. Mist descended on the pass as our expedition set out from Pheriche to Leboche. The journey took us on an ascent of 700m to over 4,900m. We had woken to stunning mountain panoramas that encircle the valley that is home to Pheriche. 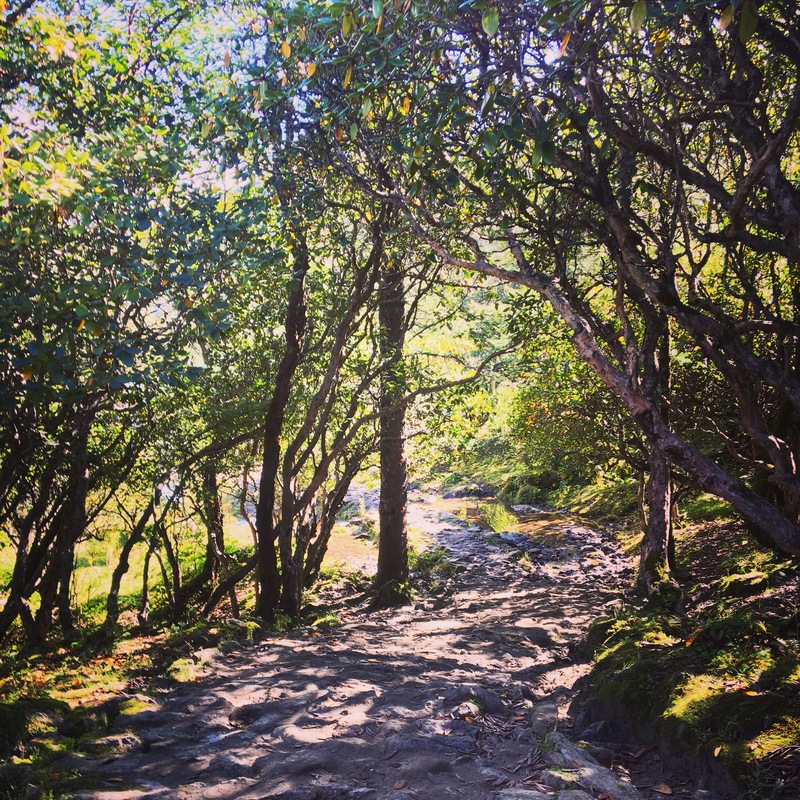 The path rose steadily all day leading us into increasingly barren terrain. It was now that I truly felt that we were reaching the roof of the world. After just a few quick steps, you become breathless. Your limbs and backpack feel heavier. Very quickly the world shrinks to just you, your trek mates and the mountain. Once in a rhythm the challenge of putting one foot in front of the other decreases. I found myself entering almost a meditative state as I focussed on my breathing and moving forwards. Always forwards into the misty, grey expanse of the Chola Pass. Suddenly the path flattened, curved and dropped slightly to reveal water, yaks grazing and our destination Leboche. 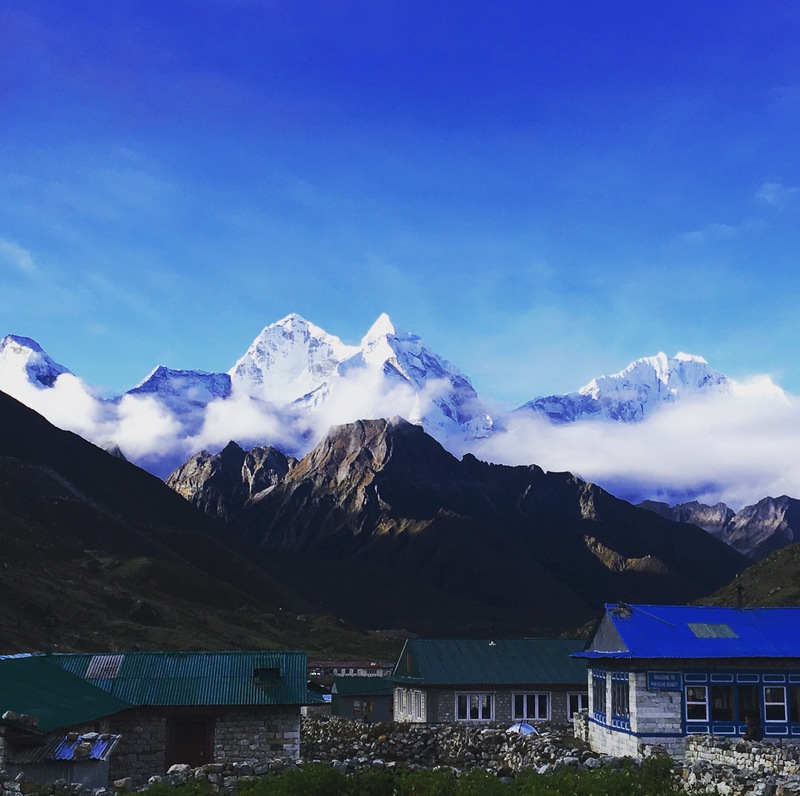 A basic yet cosy lodge at Lobuche will be our launch pad tomorrow as we ascend yet further through this harsh environment to Everest Base Camp. An eight hour trek up 456m to 5,356m will get us there! 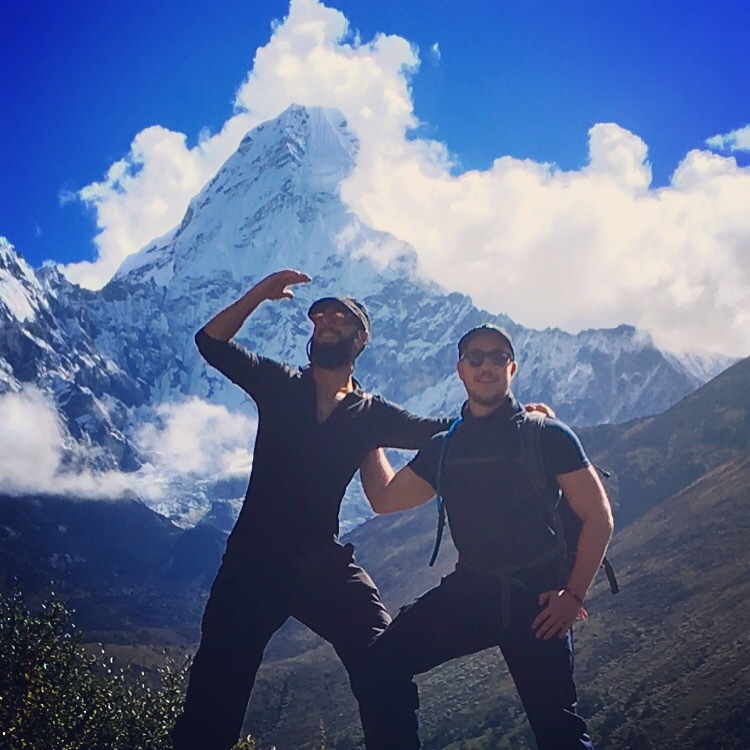 Getting as far as Tengboche has been a real team effort. A combination of enthusiasm, support, kindness and determination. We have a large group which presents benefits as well as challenges but by supporting each other both mentally and physically we have stayed together and come a long way. 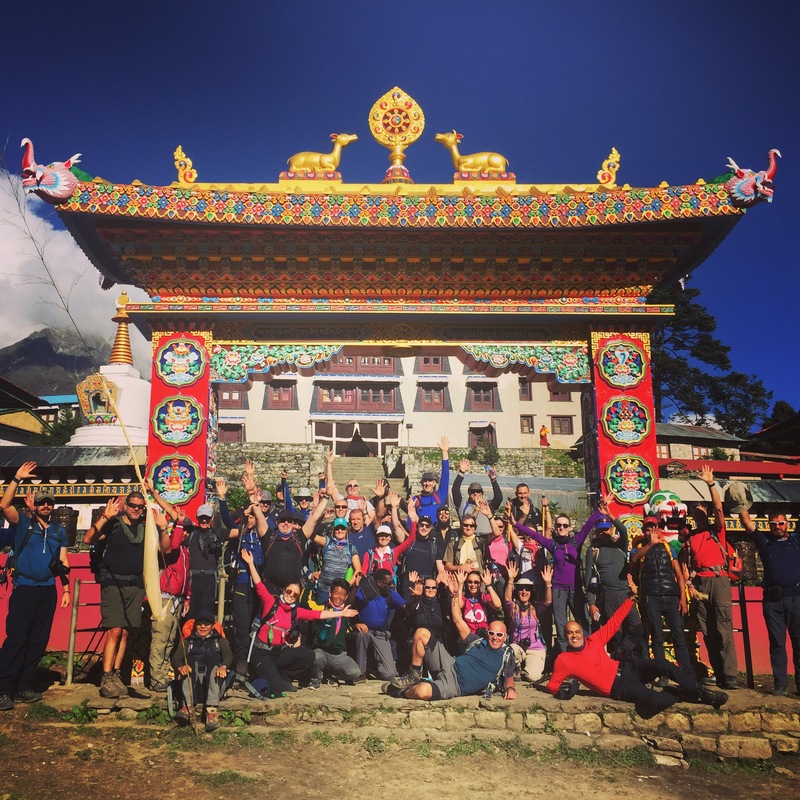 On reaching Tengboche, team spirits were high. This was compounded by one of the best views of Mount Everest possible. Even the locals came out to take pictures and selfies – the sign of a truly rare spectacle. We spent time in the largest monastery of the region and listened to the chanting of the local monks. One of whom Mark has known since 2004. It must be an incredible solitary existence living at 3,867m in the heart of the Himalayas, miles from developed civilisation. ﻿One perk the monks do enjoy though, is one of the highest bakeries in the world! Serving extremely tasty apple pie. 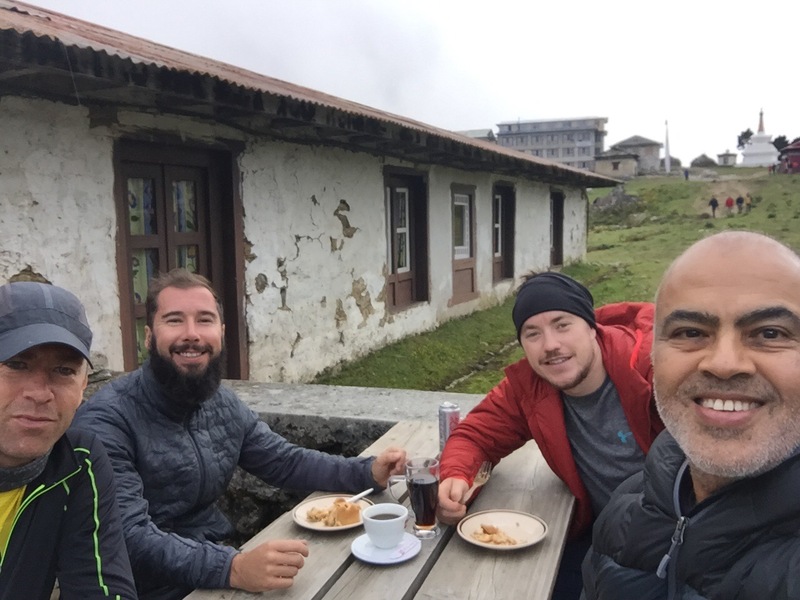 It was surreal to sit with new found friends and kindred spirits, looking at a 360 degree mountain panorama on the roof of the world – while tucking into a delicious freshly baked apple pie. A memory I will treasure. 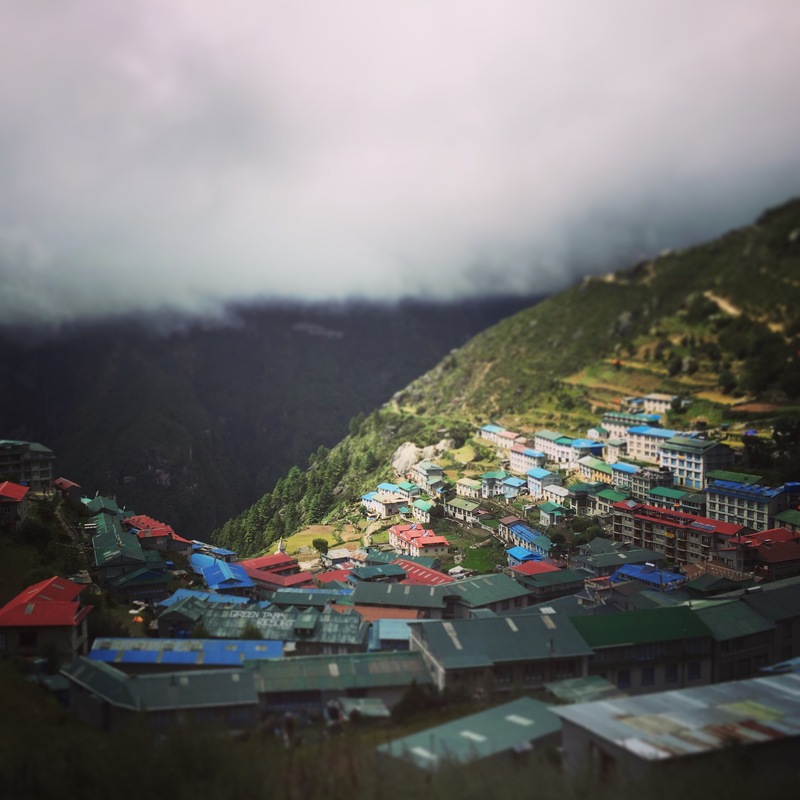 From Tengboche we will travel yet higher into the Himalayas, to the remote mountain village of Pheriche at 4,200m. The route took as through a rhododendron forest at the bottom of the valley, which after a few hours of trekking gave way to windswept mountainside. The change in terrain was dramatic and the contrast stark. After five hours of ascending a few hundred metres into high altitude, the team was ready for a well deserved rest day. 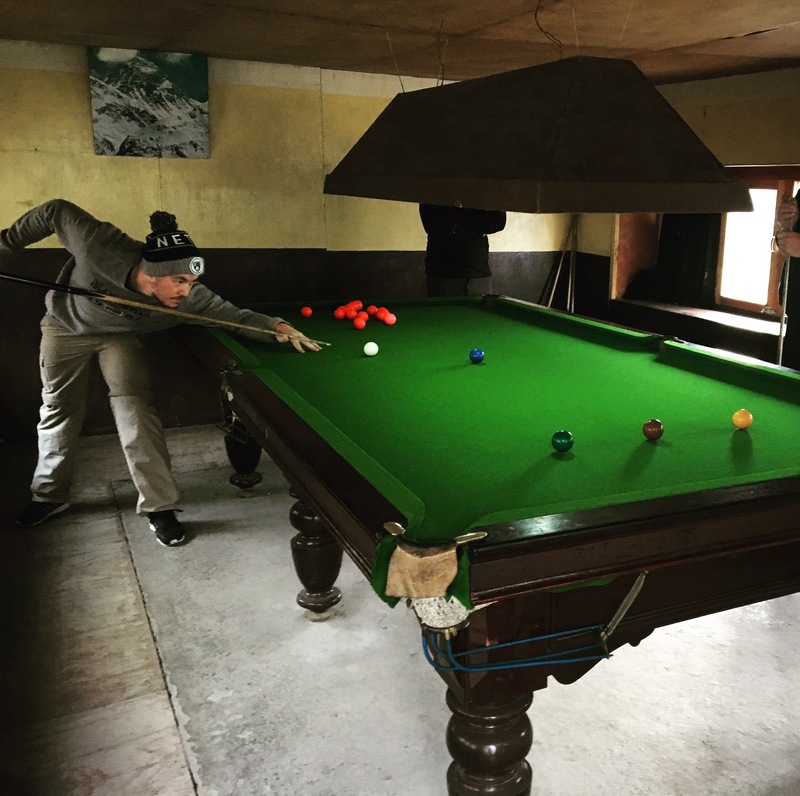 Somehow Pheriche is home to not only a well provisioned wooden lodge, but also a full size snooker table! The team swapped tales, grabbed some morning mountain sun, played cards and knocked some balls around. Our bodies further acclimatising to very high altitude. Tomorrow will be a challenging day as we ascend a further 700m across a glacier. If we make it to Lobuche at 4,930m there is a good chance we will make it to one of our key destinations – Everest Base Camp – the following day which will be Wednesday 20 September 2017. In Namchee Bazaar we met Zheng Bu, possibly the happiest monk in the world. 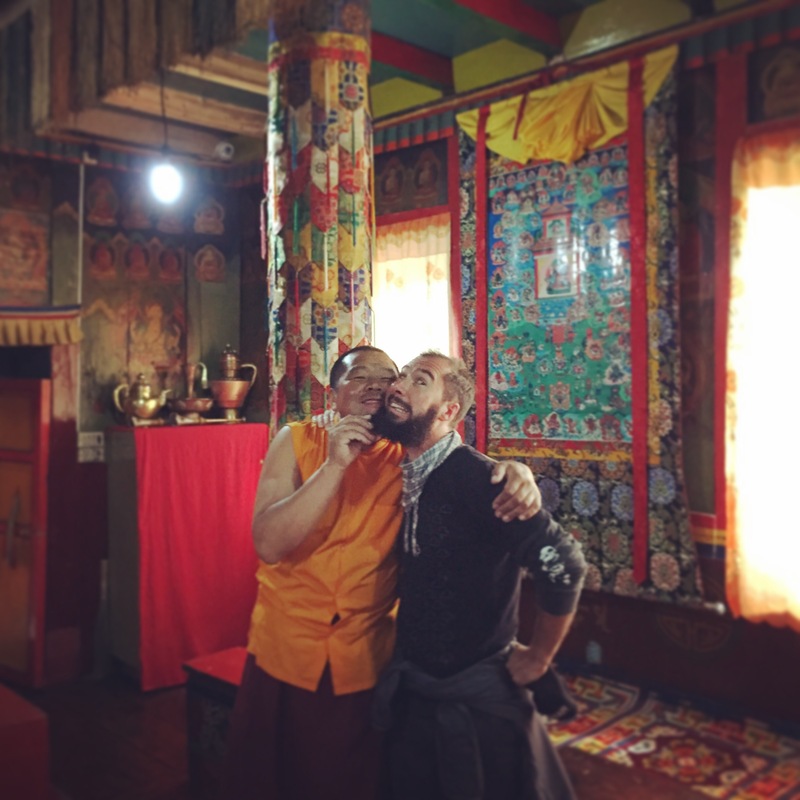 His friendly attitude lifted our spirits as he welcomed us into a Buddhist temple on the Himalayan mountainside with jokes, laughter and blessings. He organises a three month long celebration each year running from April to June with lots of singing and dancing. ﻿Zheng Bu taught us a mantra and we sat for a while, feeling our bodies acclimatise to high altitude. 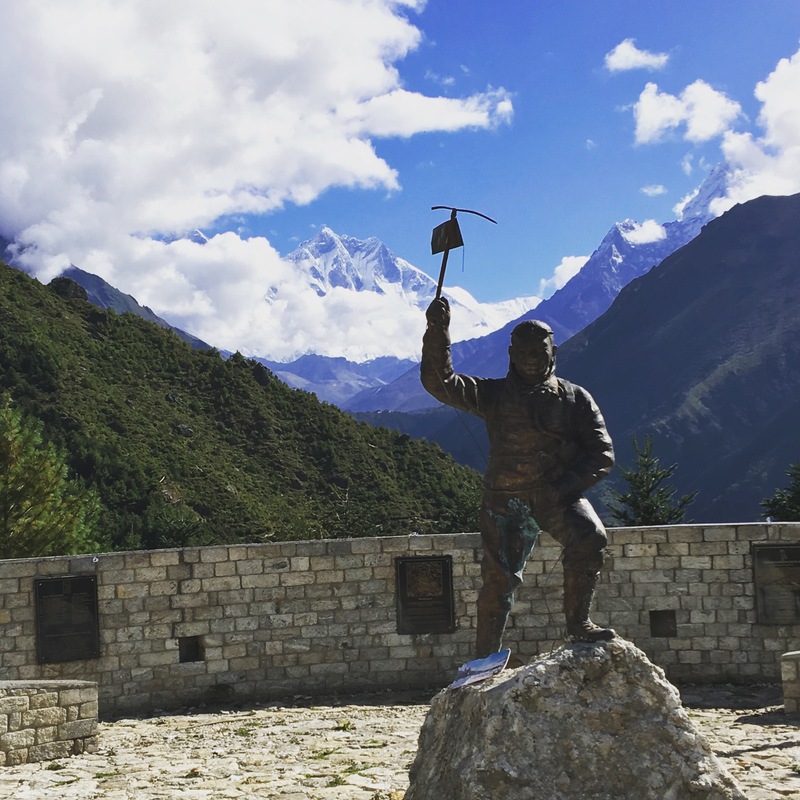 We also visited the statue of Tenzing Norgay, one of the most distinguished Sherpa’s in the world. He is most well known for being first to the summit of Mount Everest with Sir Edmund Hilary. On a clear day you can see Mount Everest on the horizon, shining in tribute to Tenzing and Hilary’s achievements. This was a welcome rest day, as we prepared ourselves mentally and physically for the next stage of our challenge. Tomorrow we leave for Tengboche, making our way further into very high altitude up to 3,870m. 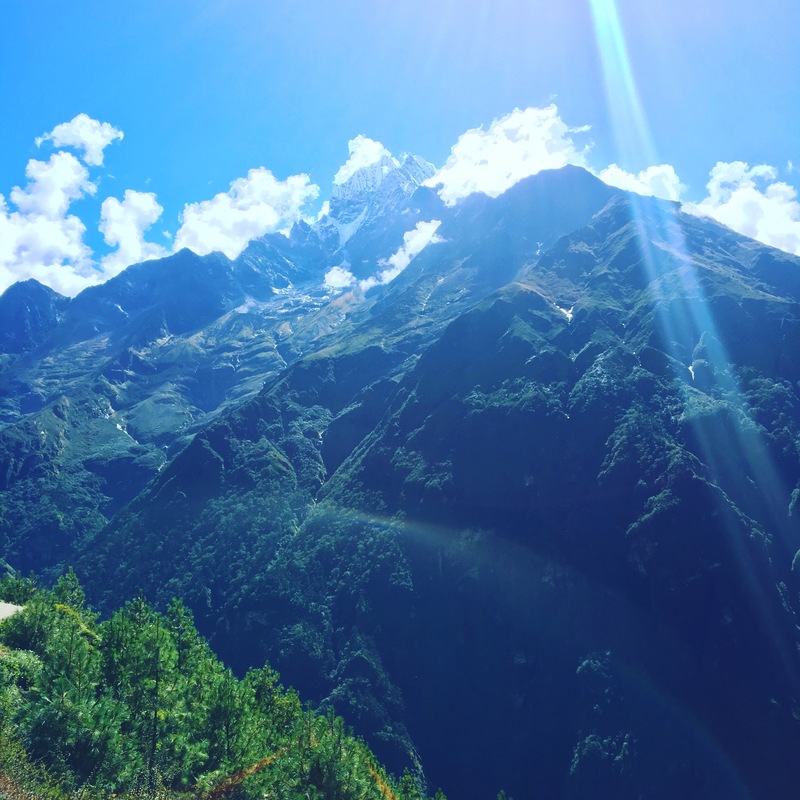 The mountain trail offered spectacular views of some of the highest Himalayan peaks, they stood tall like rock giants looking down into the Khumbu Valley. Mount Everest, Lhotse, Ama Dablam, Thamserku all close to 7,000m towered above us, a truly humbling experience. Occasionally we caught glimpses of the mighty Mount Everest through the clouds. The mighty mountains majestic snow covered lines spurring us on. 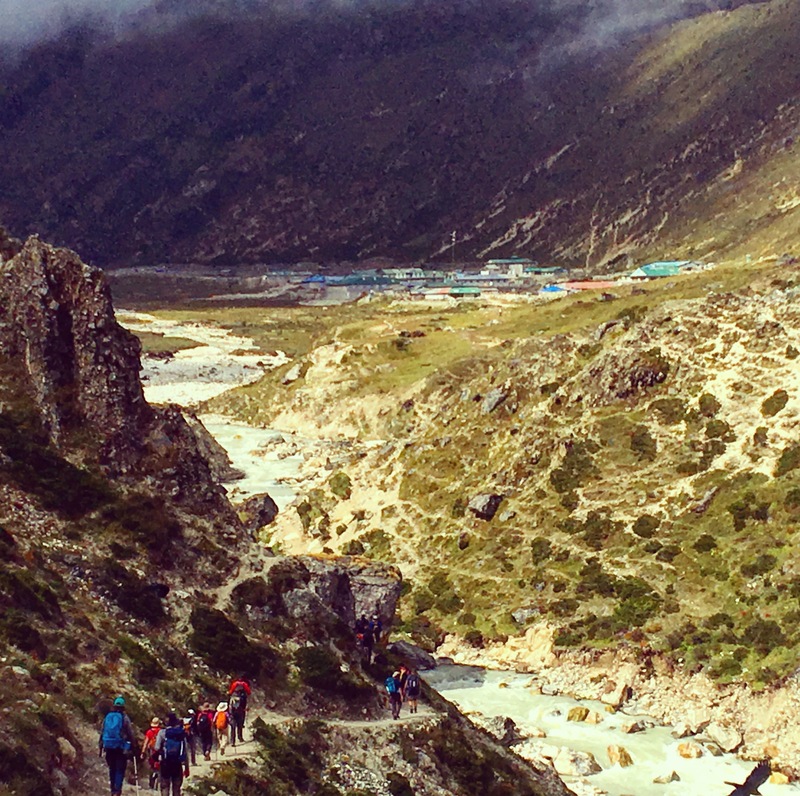 We made our way along one side of the Khumbu before dropping down steeply to the river running through its bottom. Here we stopped for lunch and prepared ourselves for a steep incline up to Tengboche, home to the largest monastery in the Khumbu Valley. From Lukla we began our journey on foot through the Khumbu Valley to Phat Ding, we stayed the night before heading out to Namchee Bazaar. The eight hour hike to Namchee marked the start of our trek for real. Spirits were high and our expedition team has really started to bond. Resulting in some form friendships and even some naked male bonding under a waterfall. We crossed incredible bridges made from ropes of steel. They swung with every step, increasing the feeling of elation and mild vertigo. There were some impressive displays of courage as with support from Mark Wood and the rest of the team, members of our party faced down their fears. In the Khumbu Valley, Sagmartha National Park covers about 1,200km all above 3,000m altitude. Mountain ridges higher than 5,700m surround the Khumbu. 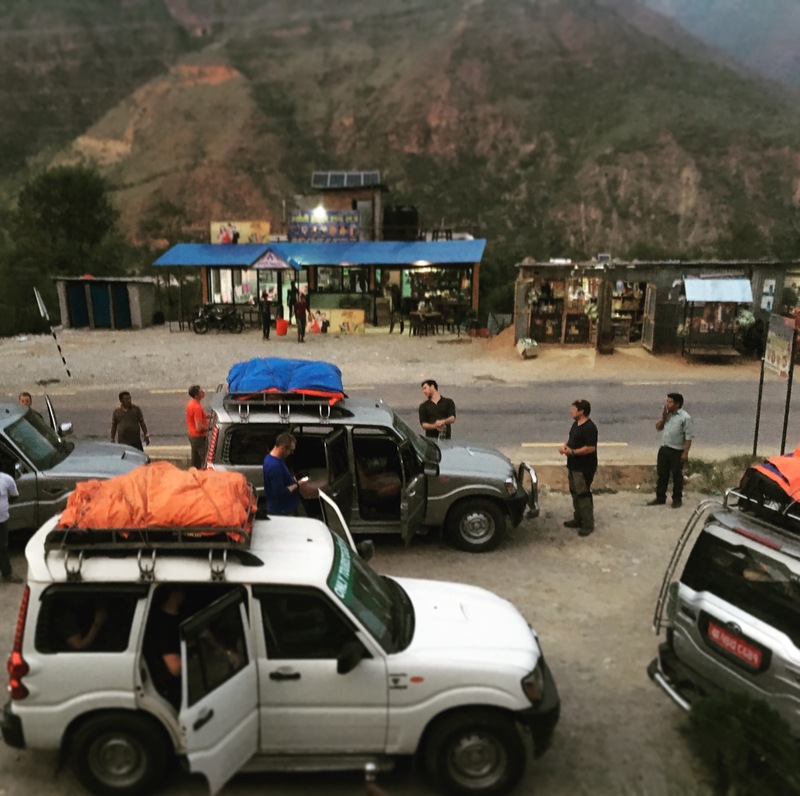 On the north the park shares a border with Tibet along the crest of the Himalayan peaks. 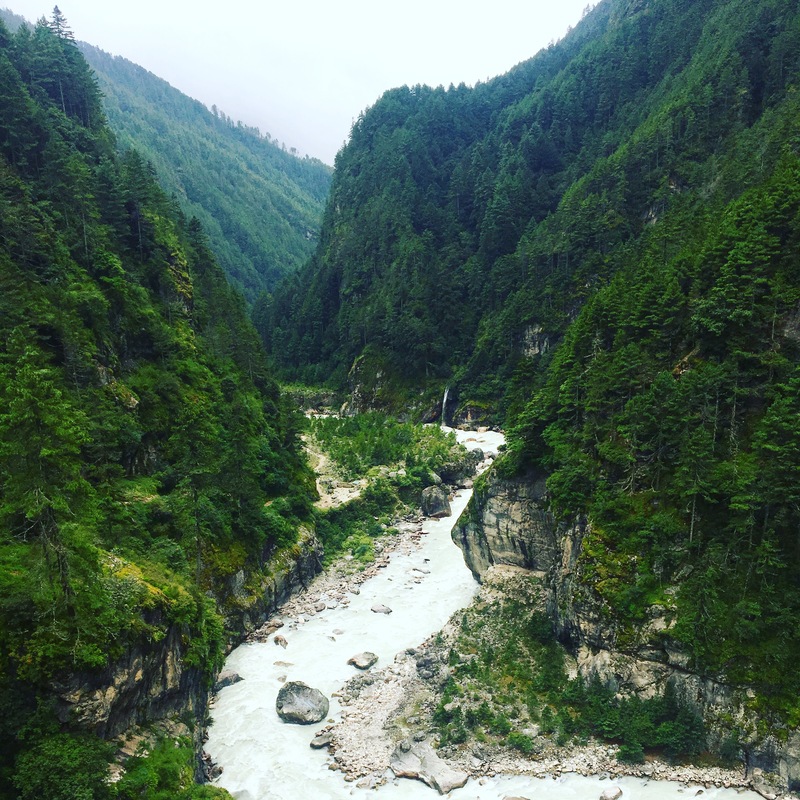 Three rivers drain the area the Dudh Kosi, Imja Khola and Bhote Kosi. 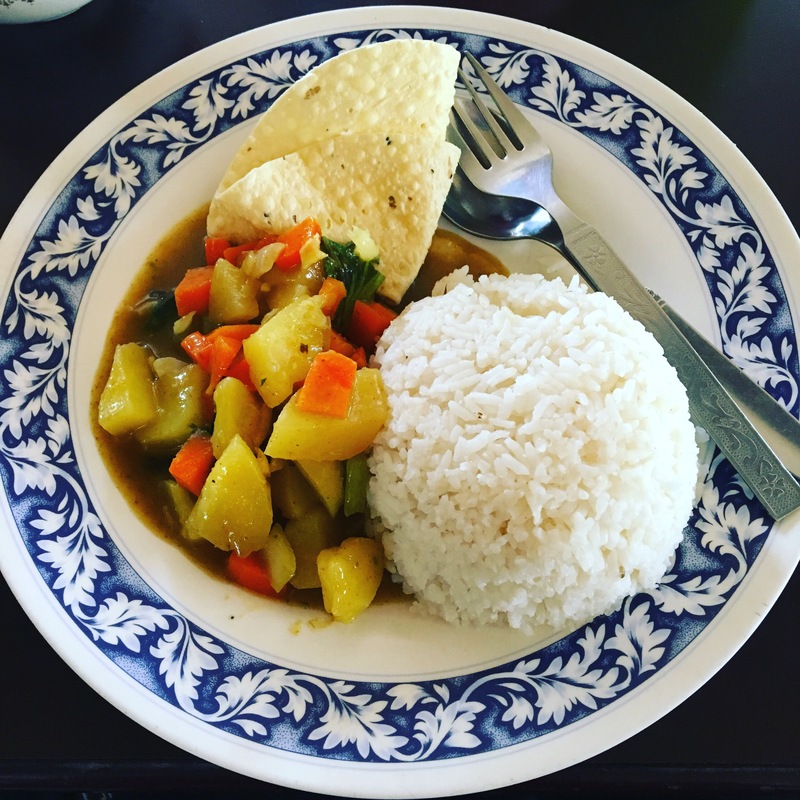 The area conserves subtropical jungles with tigers and rhinoceros on the low Terai plains to glacier covered peaks and alpine valleys in the high mountains. 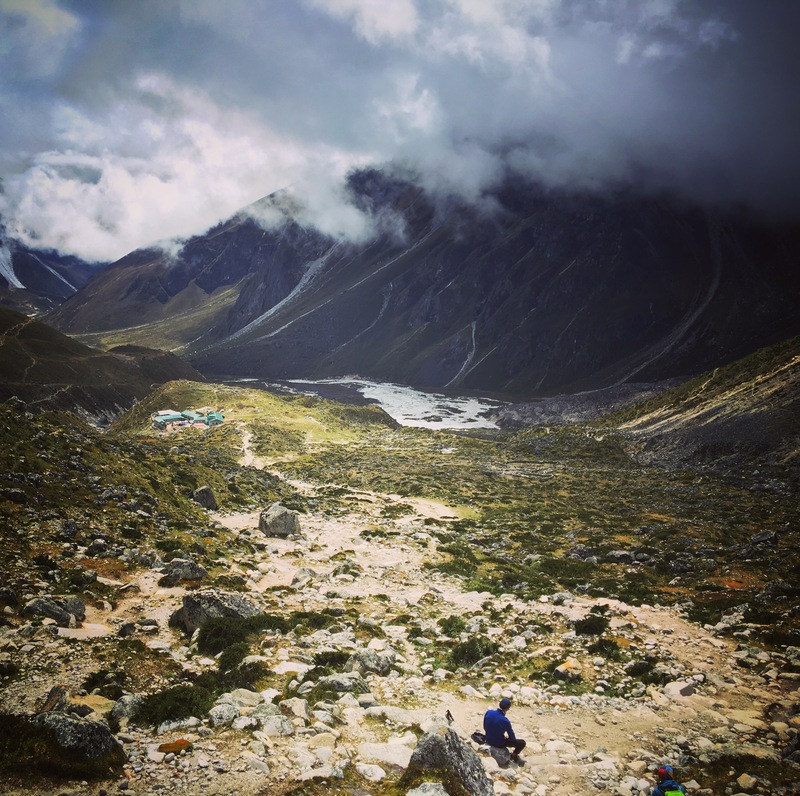 To the first Sherpas, the Khumbu Valley was unique and special as a ‘beyul’ a sacred valley that was set aside by Guru Rinpoche, the founder of Buddhism, to be a refuge in times of trouble. 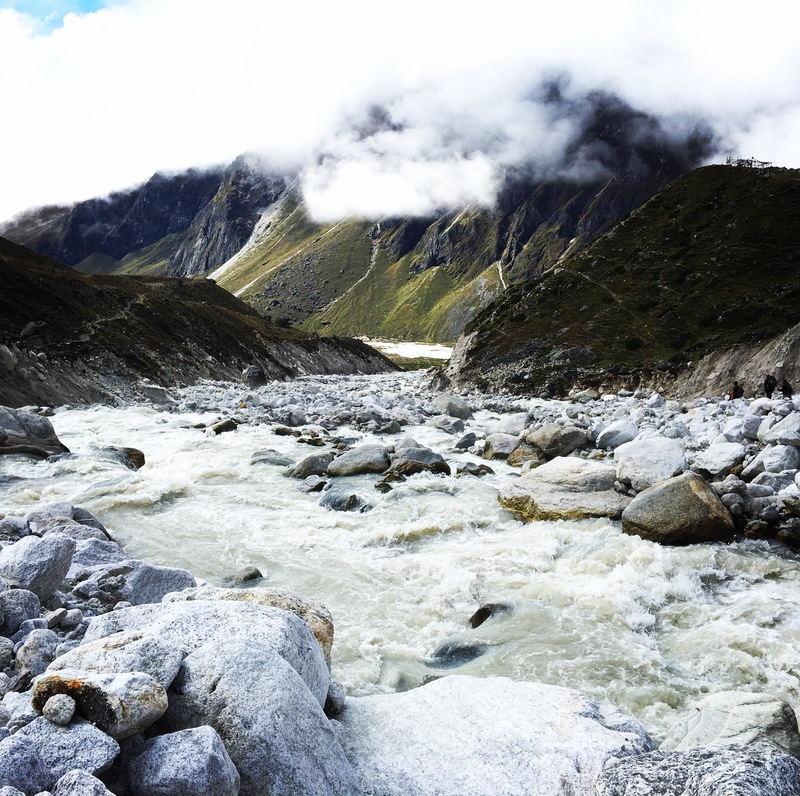 Politics and climate change played a part in Sherpa migration to the area 400 years ago. As the snow and ice here has receded year on year, settlements have developed higher up the mountains. However evidence suggests that people were visiting this valley well before the Sherpa people. Pollen analysis and C14 dating of buried charcoal reveals cereal grains mixed with the pollen and that some areas of the forests had been disturbed by fire as long as 1000 years ago. ﻿Oral traditions suggest this may have been the Rai shepherds using the areas high pastures. ﻿Extreme weather conditions exist here, snow may fall from October to June and night time temperatures may drop to -10C above 2,500m and down to -30C above 4,000m during the trekking season. Our eight hours of trekking took us rapidly up over 1000m to a high altitude of 3,440m. 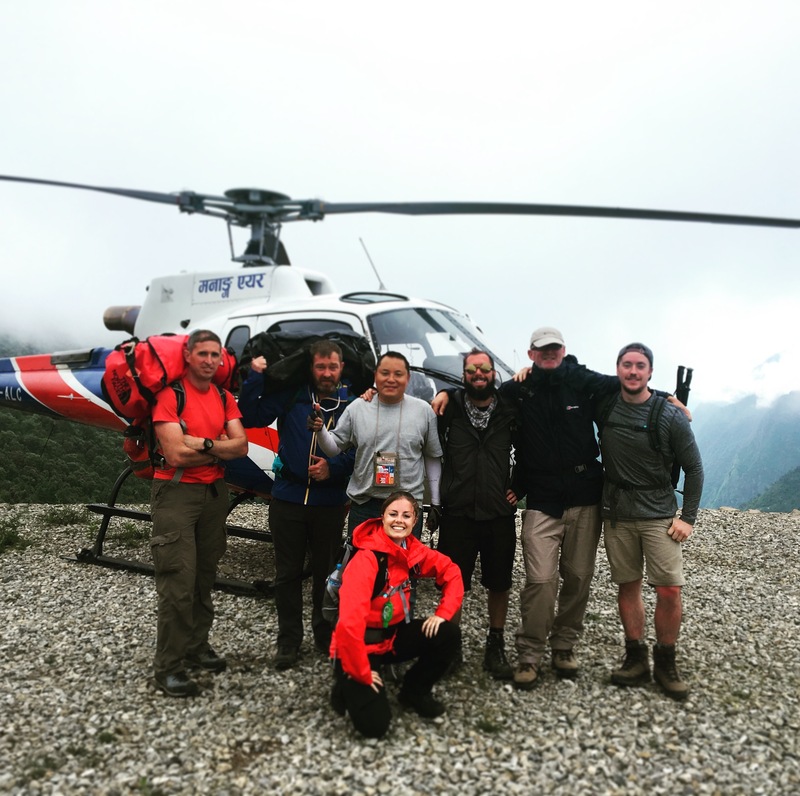 It was crucial to move at a steady pace to limit the effects of altitude mountain sickness (AMS). 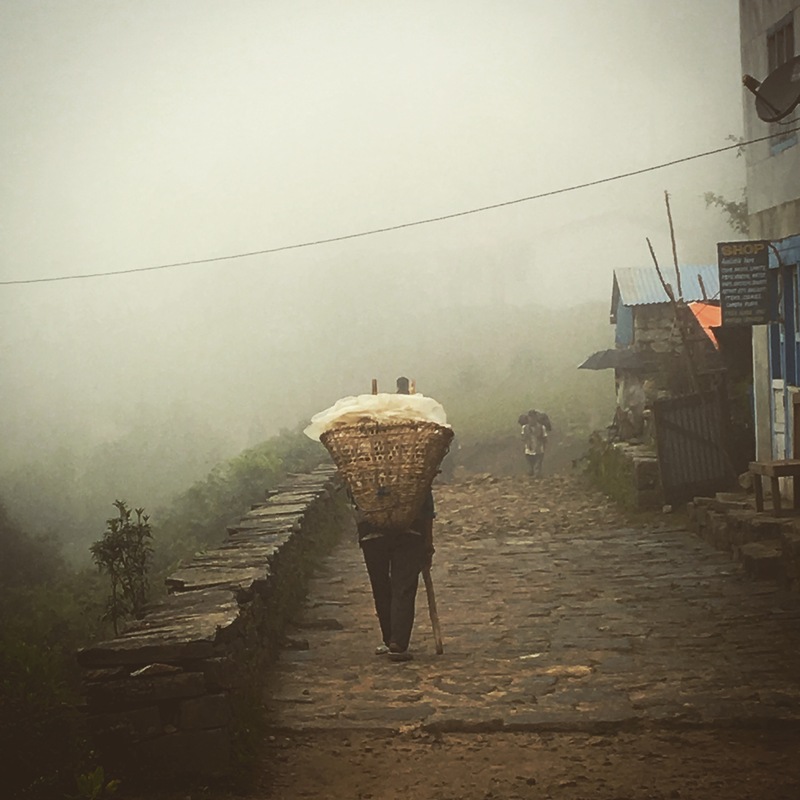 When Namchee Bazaar appears out of the mist as you round a bend in the trail, it looks like a lost city. Nestled in a bowl of the mountains, the carefully built grey brick buildings represent civilisation in the wilderness. 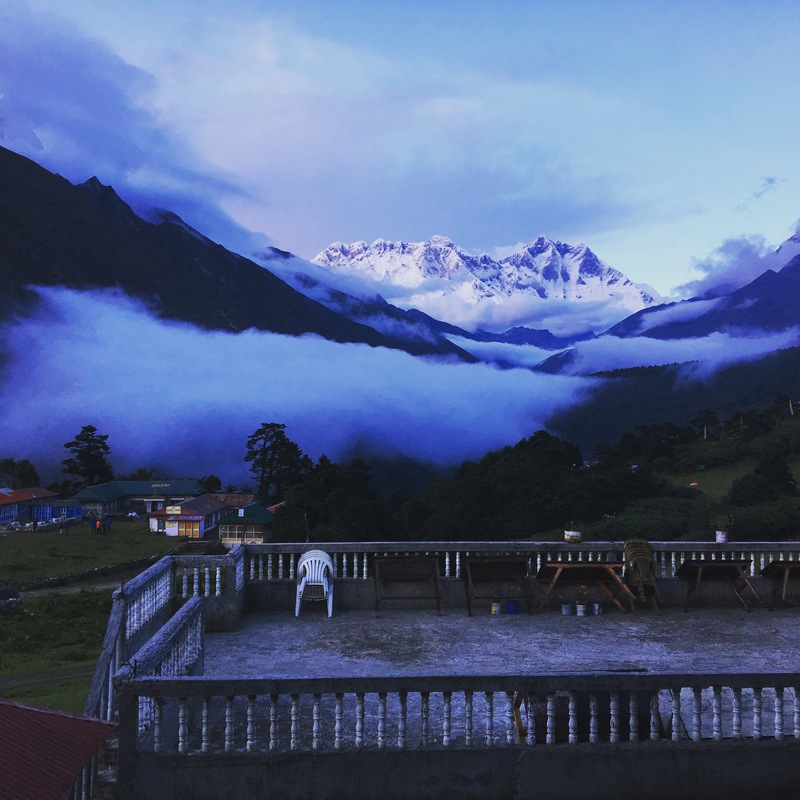 Namchee is a Mecca for mountaineers and trekkers with many of the worlds most famous climbers and explorers using the town as a launch pad for Himalayan adventures. As a result it is quite well developed with provisions to refresh and restock kit and provisions. 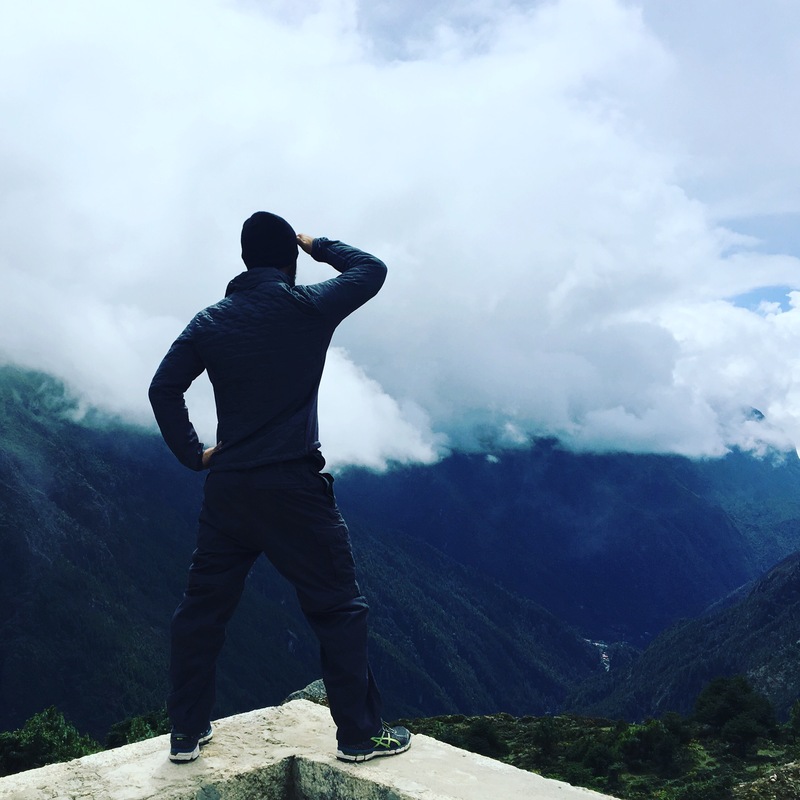 From here we will head deeper into the Khumbu Valley, heading into what is classified as very high altitude, over 3,500m above sea level. Our next destination is Tengboche at 3,870m hosting the largest Buddhist monastery of the region. It is crucial now that we take it at a steady pace as our bodies adjust to the low oxygen conditions. The adventure continues. Imagine a religious melting pot, sprawling throughout a lush green vally surrounded by misty peaks on all sides. 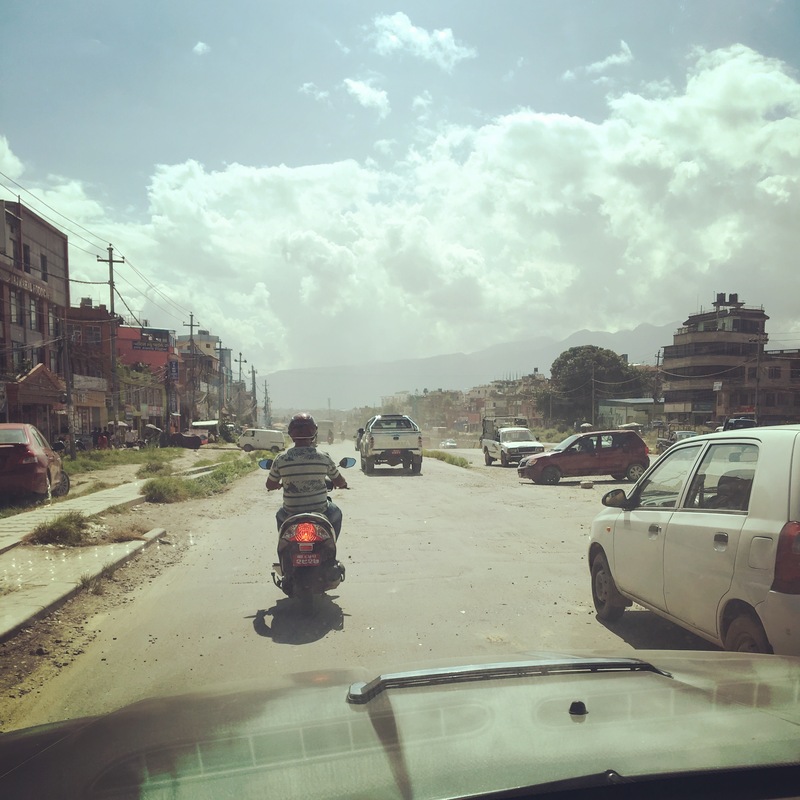 Kathmandu was established as early as 900 BC and has attracted settlers and visitors for over a thousand years. In medieval times it was known as Kāntipur, which is Sanskrit for City of light. Buddhism and Hinduism are the main religions and the city is packed to bursting with awe inspiring temples large and small. Over 100 languages are spoken in Nepal, the predominant one being Nepalese. The chirpy, chatty sound of this endearing language mingles with the chaos ensuing from the 1.4 million inhabitants of the city area, who are jam packed into the dusty hustle and bustle of a cultural capital, boasting very little in the way of organised infrastructure. Rickshaws, tuk tuks, cars, buses, motorbikes and scooters crowd the narrow streets and are forced to weave in and out of crater sized pot holes, tourists, stray dogs and the occasional sacred cow or oxen. Down by the Bagmati river visitors can witness vibrant Hindu weddings on temple rooftops metres above sombre funeral pyres taking place on concrete platforms along the river bank. As the fires burn out, the ashes are brushed into the brown swirling river. The river is considered holy by both Hindus and Buddhists. Generations of inhabitants also wash themselves in the river, believing it is the secret to long life. Back in the heart of the city, Durbbah square plays host to the countries royal palace as well as the house of the young goddess. She will remain in this exalted position until pubity, when another young goddess will take up the reigns. Further out on the hillside, breathtaking views over the city can be found at Swayambhu, affectionally known by tourists as ‘Monkey Temple’. Set into the jungle of the hillside a relentless number of steps lead visitors through a myriad of small temples and places of worship. Monkey groups of all ages, shapes and sizes have made this area their home. The enormous jungle trees provide all the trappings of their natural habitat, while temples, benches and even a specially designed ‘monkey swimming pool’ make the place quite luxurious for them. Some even posed for photos, looking out at the shimmering expanse of the city below. As the sun sets and the city cools, it is given a new lease of life with honks, whistles, woops, singing and chanting issuing until nightfall. 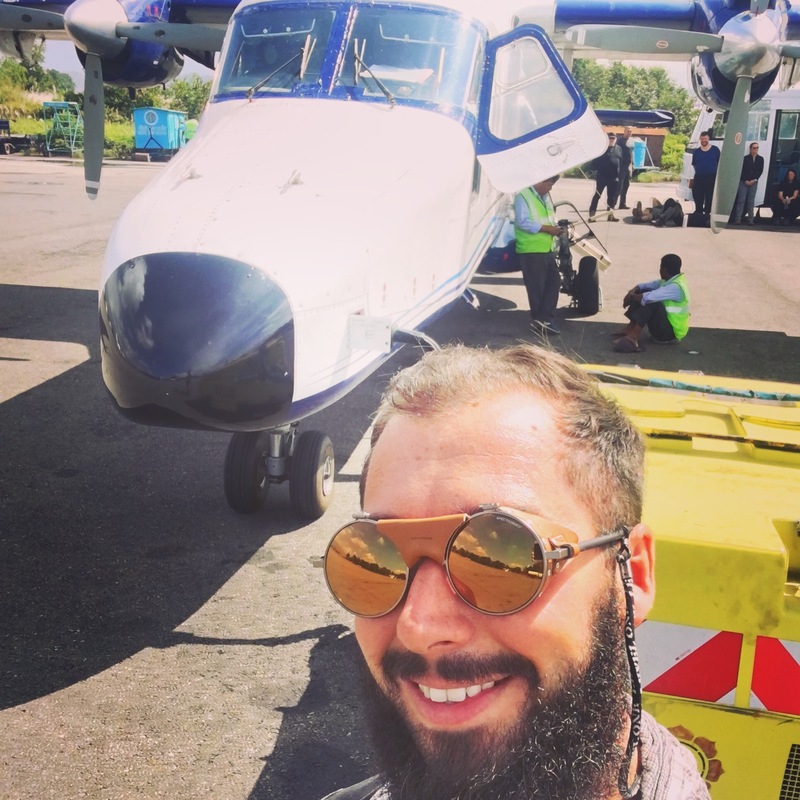 Storms, cloud and mist in the mountains on Monday meant no flights were allowed to land at Lukla airport. 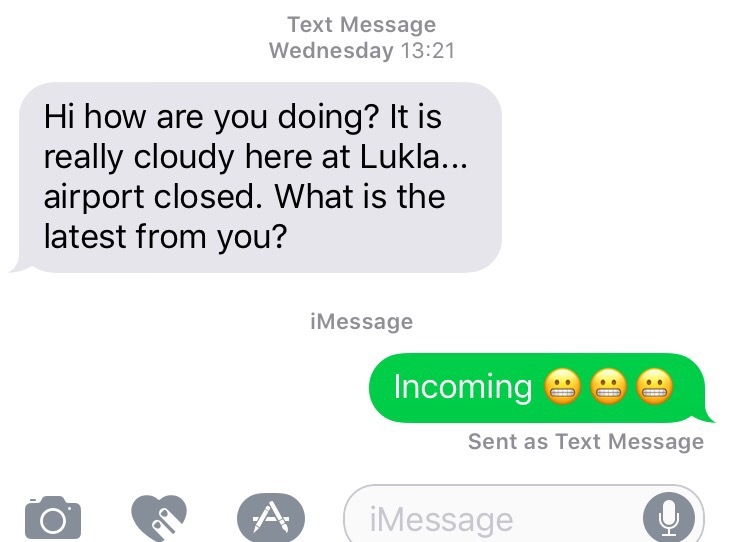 After 6 hours of waiting and actually boarding the plane on the runway, all flights to Lukla were grounded in Kathmandu. 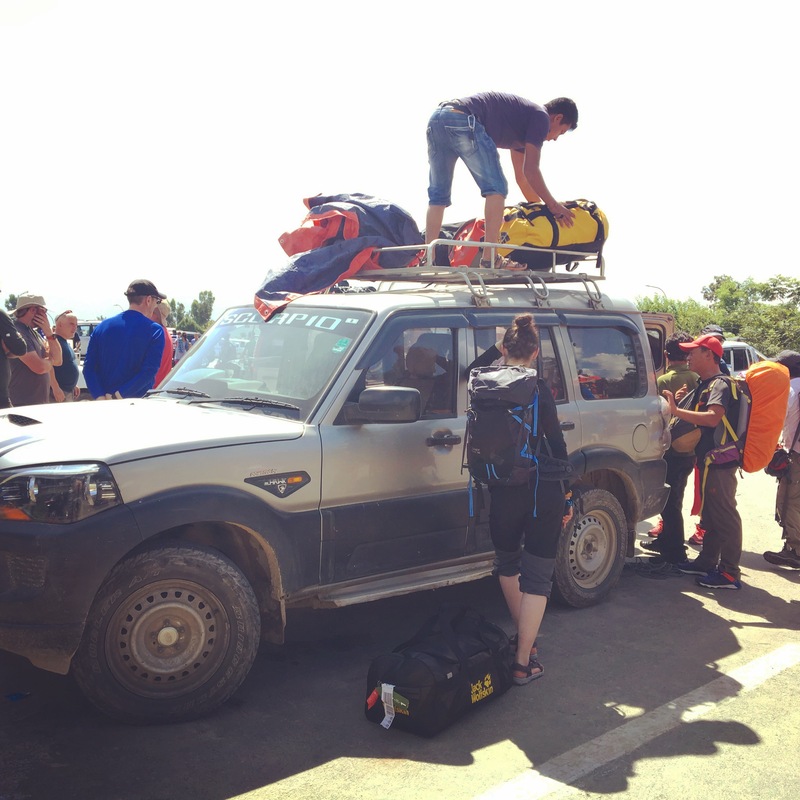 The expedition clock is ticking and after a 5am start, the team is itching to get our 20 day trek underway. 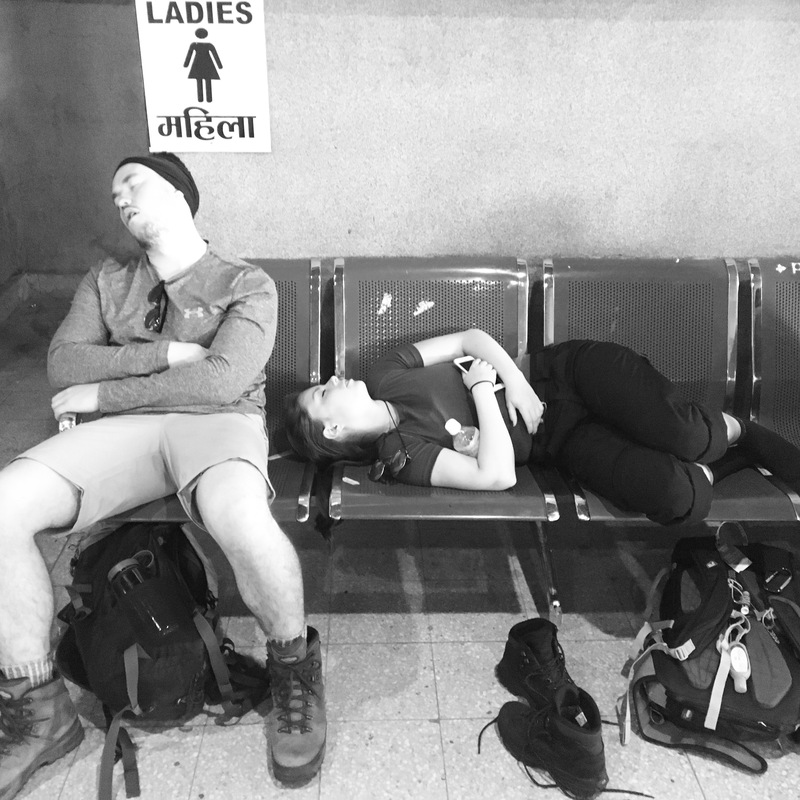 We faced two choices, go back to the hotel in Kathmandu and try again tomorrow in the hope that flight conditions improve or attempt to continue to our destination by any means.